Convert your ideas, memories and dreams to tangible and gorgeous works of art. We strive to be available to answer all your questions. Here is everything you can ever ask about canvas prints! Can I order a smaller or bigger size than those available on the website? Absolutely! Just contact our support team and they will provide you will additional information about sizes. What file formats do you work with? We can work well with PNG, JPEG, BMP and TIF formats. An image must be equivalent to 20 MB or less. If your image file exceeds 20 MB, simply convert it to RGB format in 8-bit mode and then save it as a JPEG file at the maximum quality level. If you are unable to do that, contact us for further instructions and help. Can I choose a photo border other than black or white? Yes, we would love to accommodate your choice. Simply contact us for assistance and inform us of your preference before finalizing your order. How do I return a canvas piece that I don’t love? We believe in 100% customer satisfaction. If you find a structural issue in your canvas print, like a loose or wavy canvas, any fading, scratches or bubbles or any other defect that seems disturbing, we will replace and fix the mistakes free of cost. What do I do if my canvas print has been damaged during shipping? We strive for perfection and try to ensure that your piece reaches you unscathed. However, if damage occurs, take pictures if possible. Don’t discard it and hold on to the package. Contact us and we will ship you an exact replica of your original order expediently. 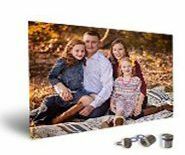 What is a split canvas print? A split canvas comprises of a single image that can be selected from our gallery or it can be a high resolution image provided by you that can be divided into 2-9 canvases to display on a single wall. This multi-pane wall display is most popularly used to display landscapes and other harmonious images with a singular theme. For e.g. a sunset or a beach. You should be careful to not choose portraits or headshots of people as they don’t end well on the finished edges of the canvas. 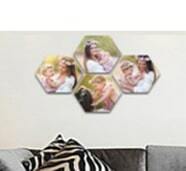 A wall display is a group of canvases that can be used to decorate a wall of your home. They are traditionally meant to cover an entire wall or a better portion of a wall. It can also be used to enhance a specific area of your home. Generally, the thickness of a wall display is 1.5 inches. What is the difference between Rolled Canvas, Hanging Canvas, Thin Wrap and Thick Gallery Wrap? Our rolled canvas prints give you a choice to frame them or to use them and display them as it is for a museum style look. This is quite convenient as each rolled canvas comes equipped with a stretcher bar, lending it a professional and exhibition style look. A hanging canvas is an unframed canvas, which is fitted between two wooden bars or our premium wooden rails. The rails are secured by powerful magnets to maximize the quality and longevity of the canvas prints. 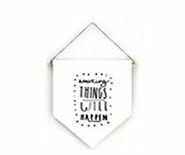 They can be hung on a nail directly on the wall for a chic farmhouse-style décor. Traditionally, the canvas prints are available in three sizes, i.e. chunk, thick and thin among which the latter two are most popular among our archives. The difference between them is due to the thickness of the stretcher bar on which the canvas is stretched. The finished thick gallery wrapped canvas is stretched over a wooden frame which is roughly 1.5 inch thick. 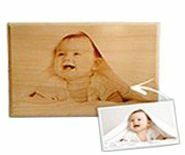 However, thin wrap canvas can be stretched around Masonite with padding between the canvas print and the Masonite to give it a raised luxurious look. What goes on the sides of my canvas? Canvases are three-dimensional images. The sides of your canvas can be an extension of your image or just solid color. You can choose either option to suit your taste. Our innovative image wrap option allows your image to continue on to the sides of your image. If your image is cropped, we can use natural extension, free of cost, and other combination of techniques to provide you with image wrap. However, if your image is tightly cropped, the edge of the canvas will be a modified image wrap, where our image specialists will create an image extension as close to your image as possible. You can also choose solid colors or colors that can be isolated from the image itself to make it better suited for the finished product. What is the canvas material that you use? A canvas print is made with durable and strong cotton or linen. Originally, it was made with hemp, but convenience has introduced cotton, linen and even polyester canvases, which allow the ink to seep into the porous fibers, ensuring that the print is ever-lasting and the ink is bright and vivid. 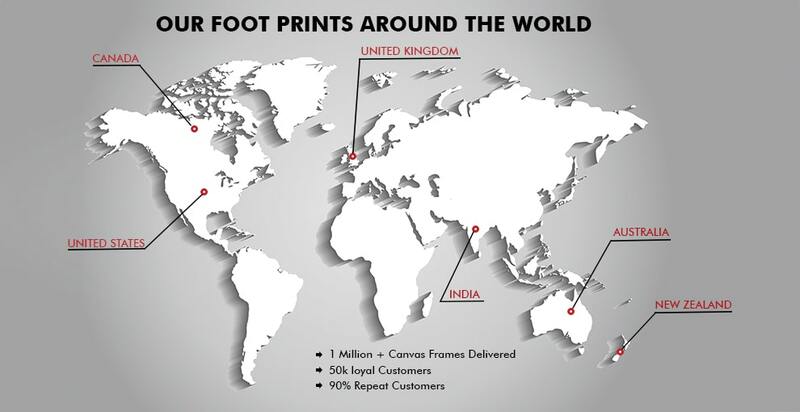 What is the printing technology you use? 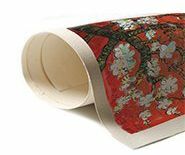 We use large format digital printing technology. Our multi pigment print technology is a marvelous choice for reproducing vibrant and rich colors that remain unchanged for decades. What image files are acceptable? Our canvas specialist accepts JPEG, TIFF and PNG image file type. What do I do if the image file I have (PDF, RAW) is not supported by your uploader? You can contact our support team for alternate instructions and they will redirect you to our FTP website. Can you fix my pixelated image? Yes, we can use all our effect and filters at our disposal to reduce the pixilation in your image. What do I do if I want to change the image that I originally submitted with my order? Get in touch with our customer representative through email, call or chat as soon as possible after placing your order and they will guide you how to submit a new image. Which image file can be used to make the highest-quality canvas? Generally a 2 MB image file is enough for our specialists to work with. But we specialize in working with most image sizes and formats. How much image will be cropped out if choose a photo wrap option? It always depends on the depth that you choose. The width options are 0.75”-3 inches, 1.5”-4 inches and 2.5”-6 inches. What will happen if I don’t know that my image is copyrighted or not? Will I be informed? Although most copyright infringements or violations are unintentional, we take them quite seriously. If your image has a copyright issue, our customer representative will contact you to remedy the situation and find a solution for it. Can I add text to the image? Off course! All you have to do is select “Just a Touch” Advanced Image Option. I the Design Instructions part, explain the color, size, font, location and the text itself that you want to add to your canvas print. You can get access to them within 24-48 hours. How do I change my shipping or billing address on my order? Just get in touch with us at 813-403-6602 or sales@canvasbubble.com and we will change it for you. How do I use a promotional code or a voucher? After you place your order in the usual fashion, enter the promotional code in the section “promo code here” on the cart page. We offer both rush shipping and standard shipping. How long does it take to get my canvas print and shipped? From the time we receive proof confirmation, it will take approximately 24-48 hours for production and another 8-10 days for standardized shipping. You can also opt for express rush shipping (5-7 days) or priority shipping (3-4 days). Can I receive my shipment on a specific date? Yes, you just have to mention it in the notes section of the order. If you need it earlier than 8-10 days, you might want to choose the rush shipping. However, it is always best to get in touch with our canvas specialist team to confirm the specifications of your order, if faced with any confusion. A tracing number will be promptly emailed to you for your convenience. As soon as your product is on the move, you will receive a shipping confirmation email with the tracking info. Simply click this tracking number and view your transit information. If you have ordered multiple products, you may receive multiple corresponding emails with tracking information. Will I get a discount as an artist, photographer or a designer? At Canvas Bubble, we love supporting artists and their love for great designs. For best deals, get in touch with one of our canvas specialists or email us at sales@canvasbubble.com. Why do you bill my credit card before production has even began? The personalized and customized nature of production makes it essential for us to bill your credit card beforehand. There is nothing to worry about, as we offer a 100% Money Back Guarantee. I haven’t received a refund, even though I cancelled my order. Should I be worried? Don’t be. It can take 7-10 business days for a credit card company to process your refund. We will help in any way. Just contact our support team and get an estimated ETA. If you don’t love it, we will accommodate your product return, as our foremost consideration is maintaining customer satisfaction and premium quality. If you are dissatisfied with an item, return it within 30 days after receiving it, for a free of charge replacement. You can also fill the return slip on the back of the packaging of your order and your refunds will be issued within 48 hours of receiving the return. Don’t find what you are looking for? Get in touch with our Canvas Specialist team and make your artistic dreams come true.